There are many things that affect the reliability of a creatinine level. Creatinine is dependent on a person's muscle size. For example, since men are typically more muscular then women, a creatinine of 1.0 mg/dl may represent normal kidney function in a man, but can suggest significant kidney dysfunction in a woman. Similarly, in a very muscular person or in someone with significant muscle loss due to certain medical conditions, the creatinine may not be a good indicator of kidney function. In addition, certain commonly used medications, like Bactrim (trimethoprim-sulfamethoxazole) and Tricor (fenofibrate) used to treat high triglyceride levels, can affect the creatinine level, making it unreliable. The use of certain muscle-building supplements like creatine can also affect it. Your doctor should be aware of all medications, including over-the-counter and herbal supplements, you are taking. Your doctor may order a urine test, called a urinalysis, to further evaluate your kidneys. This is an important test that can signal early kidney disease by detecting abnormalities in the kidneys, even if your kidney function, as measured by the GFR, is normal. 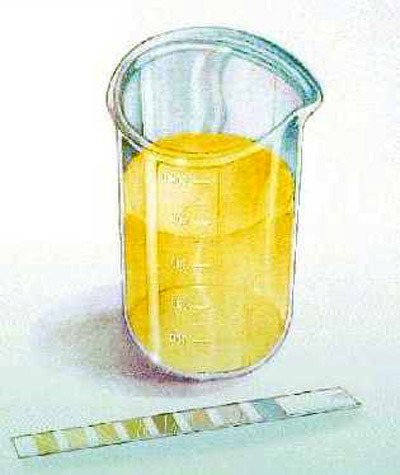 To perform a urinalysis, your kidney doctor or primary care doctor will ask you for a urine sample, and then either do what's termed a urine dipstick test in the office, or send the urine sample to a lab. Several factors can be determined by the dipstick analysis including the presence of a UTI, the presence of glucose in the urine (usually a sign of diabetes), and the presence protein or blood in the urine (sometimes a sign of kidney inflammation called nephritis). You may not notice any symptoms from the findings the dipstick test reveals. For instance, the amount of blood or protein in the urine may be so microscopic that it is invisible to the eye. That is the reason why many doctors will order a urinalys - to detect these changes early. In my practice, as well as in many other kidney doctors' practices, the urine is further examined under a microscope for signs of infection or nephritis after the dipstick is obtained. The presence of protein in the urine as discovered through a urinalysis will likely prompt your doctor to order additional tests to better quantify the amount of protein you may be losing. Proteinuria (prot-een-or-eya) is the single most important predictor of worsening kidney function. I can't overstate the importance of testing for this. There are many causes of kidney disease, and once it is discovered that you have it, your primary care doctor or your kidney doctor will order more tests to get a better understanding of why your kidney function isn't normal. If your doctor determines that your kidney disease is more of a chronic nature, she will need to order additional blood work. This battery of blood and urine tests will give her a clear indication of your kidney function. WHEN ARE IMAGING STUDIES NECESSARY? If the results of your blood work suggest evidence of kidney disease, your doctor may order an ultrasound to get a visual picture of your kidneys. This non-invasive test can show if your kidneys are blocked or obstructed, as well as reveal kidney size and texture. There are findings on a kidney ultrasound that can indicate whether or not you may have chronic kidney disease. Further studies, such as a CAT scan or an MRI, play a role in diagnosing specific kidney conditions; however, each is not without its inherent risks. To find out more, you can check out Symptoms Of Kidney Disease In Men.